I love gadgets, tech and toys. As I’ve grown older, that love hasn’t lessened. Although, the quantity of gadgets, tech and toys may have decreased slightly, the quality (and the associated cost) has increased, so there’s that. That’s just the “circle of life” or something. Anyway, that leads me to recent developments. One of these developments has to do with my search for the perfect way to make coffee at home. Some of you may be shocked and wonder how I could betray my beloved Starbucks, Coffee Bean or various other establishments I frequent. It’s simple, really, I just want to do it at home so I get used to working at home again. I would also like to save some time where I can too. On a busy morning, if I have to take the time to stop at Starbucks or wherever on the way somewhere else, it can often take quite a bit of time. So, in the interest of efficiency (and to save a buy or two, let’s face it) I’m going to make coffee at home. 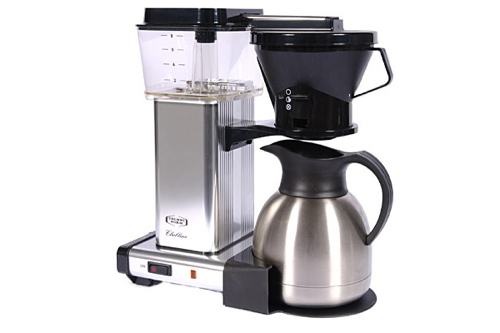 During a previous attempt at this I had purchased one of the Tasimo devices that makes coffee from a capsule. The results were less than stellar. In fact, the coffee kinda sucked. This time around I’ve done much more research and committed to a much better solution. At least I think it is. I’ve decided that the only way to make it work at home is to get the best coffee maker you can get. That one, if you ask pretty much anyone who knows anything about it, is The Moccamaster . That’s a picture of it right there. Nice, huh. I expect this little beauty to arrive early next week and I will report back on how awesome it is. Yes, I expect it to be awesome. In other news, I am also trying something else again that I had tried several years ago: going all-laptop and having no desktop Mac. At this moment, I have two computers. One is a 27″ iMac and the other is my 13″ MacBook Air. I’m am giving the iMac to a worthy person (selling, actually) and will be using the MacBook Air exclusively from this point forward. However, this choice does present a few problems. The first of which is my iTunes library is way too big to fit on the Air. So, for the moment, it will have to reside on an external drive. Not ideal. Second, my iMac also served as the media and print server for the house. With it gone, certain people are going to have to go upstairs and connect to the printer via usb if they want to print. Also, not ideal. So, that means I will most likely have to get some sort of computer to use as a file, media, print server and iTunes repository. That will most likely mean a Mac Mini. Before you ask, I’m not considering a Windows or other solution at the moment. We’re too invested in Apple tech at home to try to make that work right now. Maybe if I get some more free time I can put together a nice Windows server instead. For now, it will probably be a Mac Mini running Apple’s Lion Server that will take on those duties at home. Plus I would like to work with Lion Server a bit more so the new Mini serves that purpose as well. Of course, if I’m going to be using the MacBook Air as my only machine from this time forward, I kinda think it should be the latest model, don’t you? Just go with me here, okay? The one I have know is a 13″ 2.13 Ghz Core 2 Duo with 256 GB SSD. I feel a newer 13″ MacBook Air i7 would be better for the tasks to come. Plus, I would like to give my previous generation Air to someone I think will like it. Yeah, that’s good reason. So, lots of changes coming in my tech world. Fortunately, I don’t mind change all that much — especially when it brings newer, shinier toys. This entry was posted in Apple, Coffee, Cool Stuff, Gadgets, Personal and tagged Apple, Coffee, mac, Mac Book Air, MacBook Air i7, Macintosh, Moccamaster, The Moccamaster. Bookmark the permalink.